I have posted many times on how beautiful Austrian curtains are, and this photo really highlights that beauty! There are some great photos in this set that show exactly what each component is and help with the installation process. I have discussed Kabuki Systems and Solenoids in the past, but I know that sometimes it is hard to visualize from a written post. Hopefully these photos will help. As I mentioned in my first post, I was contacted by Megan to work on the backdrops and other soft goods for Crue Fest II tour. I had the pleasure of working with a creative genius, Mr.Scott Holthaus, to help him manifest his vision for the show. Crue Fest II celebrated a milestone anniversary for Motley Crue’s wildly successful Dr. Feelgood album. Every detail down to the CMYK value of the tiles was carefully considered. 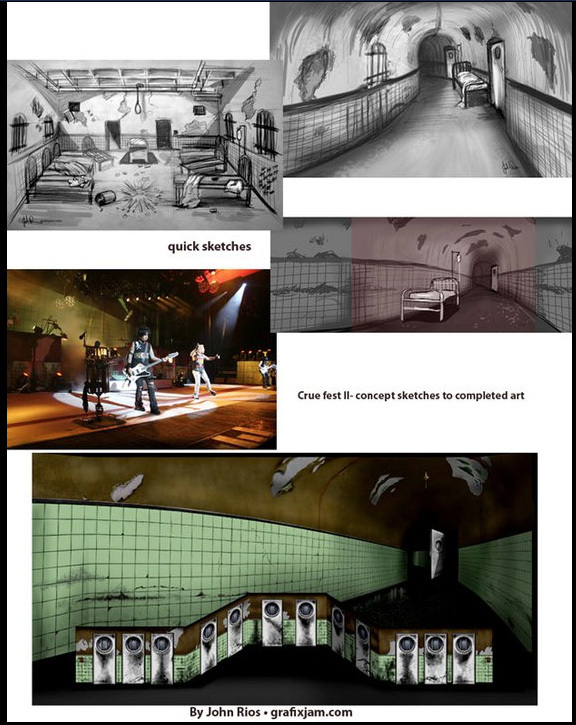 The concept was to create the insane asylum that is indicated on the Dr. Feelgood album cover as it would look if you revisited the facility twenty years later. The concept had vast possibilities so we decided to do a series of quick sketches first to narrow down a direction. Obviously these are not award winning illustrations but more so used like a storyboard would be in a movie. They indicate size, scale and perspective as well as content so that we can cut right to the chase on the computer once the direction is decided. It does take a person of vision, like Scott, but the end result is a faster development from an production art standpoint. This project was mammoth so it did take a few weeks to complete but, the quick sketches let us work out details and cut right to production worthy art within 24 hours of our first conversation. If you’re developing an involved or complex concept, I’d welcome working out the details with you in the same fashion. Time for Number 7 in my continuing series on some of the rock ‘n’ roll clients for whom we have been privileged to work. Whether it is custom stage curtains or wide format digital backdrops, it is always a blast to know that our work is being seen in arenas across the country and the world. Today I thought I’d focus on Mötley Crüe. In 1981, bass guitarist Nikki Sixx and drummer Tommy Lee formed the band Mötley Crüe, adding lead guitarist Mick Mars and vocalist Vince Neil shortly thereafter to form the core 4-man group. The band released its first album, To Fast for Love, under its own label, Leathür Records, late that year, and were subsequently picked up by Elektra Records in Spring 1982, a relationship that lasted for more than 15 years. The band enjoyed international success throughout the 1980s, releasing four albums (including 1989s Dr Feelgood). Despite their earlier success, the 1990s and early 2000s were a difficult time for the band, even with the release of three more albums during this time period. Vince Neil left the band in early 1992, and, though Mötley Crüe continued on with replacement vocalist John Corabi, the band’s popularity diminished during this period. In 1999 Tommy Lee would also leave to pursue a solo career. In late 2004, the four original band members – Sixx, Lee, Neil and Mars – reunited and began a reunion tour in early 2005. Since then, the band has released two albums and have toured repeatedly, including their current 2011 tour with Poison and New York Dolls. Sew What? has made a number of pieces for Mötley Crüe over the years, including a digital printed backdrop. Want to hear “Without Warning”? ﻿Check out Without Warning, live from Hemishpere’s Recording Studio this Saturday night at 8:00 PM Pacific Time. Hello followers of the Sew What Inc. Blog. I was asked to contribute to this blog on a regular basis, so I thought I’d tell you a bit about myself first, so you’d know something about the person posting. I own and operate Grafix jam, Ltd. Over the last sixteen years I’ve worked as a graphic designer, illustrator and creative consultant to a multitude of industries which include everything from the automotive industry , sports and entertainment industries , toy and game industries to you name it. I became aware of Sew What, Inc. a few years ago through working with a long time client, Ted Nugent. As luck would have it, Megan remembered me from that project, so when she needed someone to assist with illustration of the monstrously sized Crue Fest II dual stage, she contacted me, and the synergy was instant. Since then I’ve been in-trusted with working directly on several projects for Sew What Inc’s most valued assets, their beloved clients. This brings us to today. My love of all things stage, show and rock-n-roll and my skill-set has found a more permanent home at Sew What, Inc. I look forward to focusing my creative energy on you, the client, and working with and assisting you in any way I can. Thank you, Megan. I’m ready to get the show on the road….